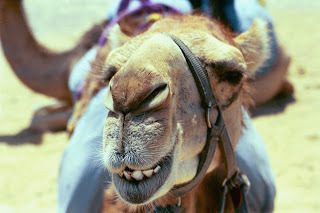 Linda Grimes: Visiting Reality : A Very Happy Hump Day. AKA, Congrats to Susan Adrian! A Very Happy Hump Day. AKA, Congrats to Susan Adrian! Look at the smile on this guy! Why is this delightful dromedary so happy? Why because he knows my longtime friend and critique partner, Susan Adrian, sold her fabulous book, THE TUNNEL. In a second deal coming out of St. Martin’s Press this week, Brendan Deneen bought world English rights to Susan Adrian’s debut, The Tunnel. The YA thriller, which Kate Schafer Testerman at kt literary sold, is set for a summer 2014 release. In the novel, a teenage boy who has a power he calls tunneling—he can decipher where anyone in the world is (and what they’re doing) by holding something they own—is brought to the attention of the U.S. government. Adrian, a former ballerina, lives in Montana. I can't begin to tell you how well-deserved this is. Not only is Suze a super CP, she is an amazing writer who has worked her posterior off for many years--a testament to persistence. As anyone in the book business knows, talent isn't enough to guarantee publication. Those damn stars have to align, too. And now they have. I couldn't be happier for her. Or for the reading public in general, because they are going to LOVE this book! Let's all join Suze in her happy dance! Congratulations, Suzerooni. I'm so proud of you I could just bust! Yay! Happy Dance for Suzan!! That's fantastic! So happy for her! Happy happy, cha cha cha. Congrats to Susan! Her book sounds great! Congratulations Suze - camels are smiling, Snoopy's dancing, Linda's smoking a cigar in your honor and I have a good reason for a glass of wine. Only for you, Suze! i saw susan's news earlier and i'm still as excited now as i was then. although, sigh, the thought of waiting to read this book is a bit depressing. maybe as her CP, you could give us a few hints. Congratulations to Susan -- and I love the premise of her book!